The 9601 high security DeadlockGuard is available in two widths and has four bolt through security fixings. Because of its popularity as a high security product, the wider version, in the more common UK and Euro keyways, is available in more finishes. The slightly narrower version is perfect where a large door stop and draught excluder is fitted to a door with a 2 1/2" deadlock. 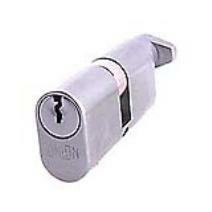 Ideally, a cylinder rim lock should not be fitted too close to a mortice lock. As a rule, the mortice lock would be fitted at about a third up from the bottom of the door and the rim lock at about a third down from the top of the door. Occasionally, these locks are fitted so close together on a door that the longer 9601 DeadlockGuard will not fit. For any customer encountering this problem, we recommend the shorter 9600 or 2000 DeadlockGuard. Always check - before ordering. This DeadlockGuard offers substantial security with two bolt-hrough security fixings. It's the most popular DeadlockGuard and is available in more finishes. This very substantial DeadlockGuard has two bolt-hrough security fixings and reversible plates that can very easily be removed, reversed and refitted at a future date to conceal any accidental scratches or other slight damage to the original finish. 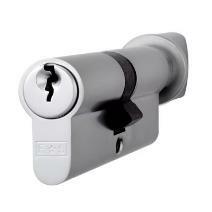 *Very carefully check that you are ordering a LockGuard with the correct keyway for your lock. A Two Bolt Lock Guard.